Media representatives are kindly invited to cover the business event "Smart urban municipalities/cities and energy efficient industries" in Albania. We hope to see a diversity of Albanian media - both visual and printed media. The application in a form of an email should be sent to the organisers: Mr. Zarko Masanovic (zarmas@um.dk) or Ms. Almira Pajenga (alma@urbandanish.solutions) no later than 1 June 2018. Please include a brief information about the media, number of persons applied, their names, functions and contact information. 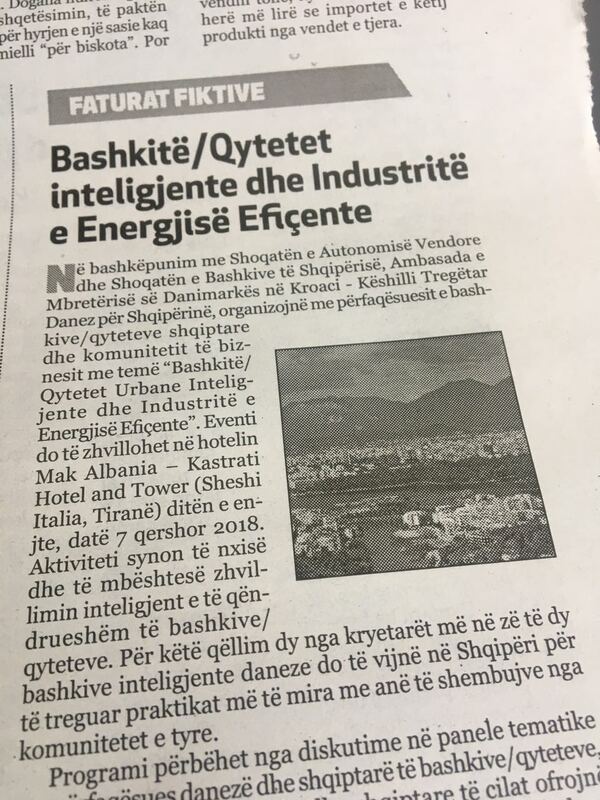 Përfaqësuesit e medias në Shqipëri, janë të lutur të pasqyrojnë eventin e biznesit “Bashkitë/ Qytetet Urbane Inteligjente dhe Industritë e Energjisë Efiçente”. Një pjesëmarrje e gjerë e medias shqiptare vizive dhe e shkruar është e mirëpritur. Aplikimi duhet të dërgohet me email te organizatorët: Z. Zarko Masanovic (zarmas@um.dk) dhe Zj. Almira Pajenga (alma@urbandanish.solutions) jo më vonë se data 1 Qershor 2018. Aplikimi duhet të përmbajë një përshkrim të shkurtër mbi median që përfaqësoni, numrin e personave që aplikojnë si dhe emrat e kontaktet e tyre. 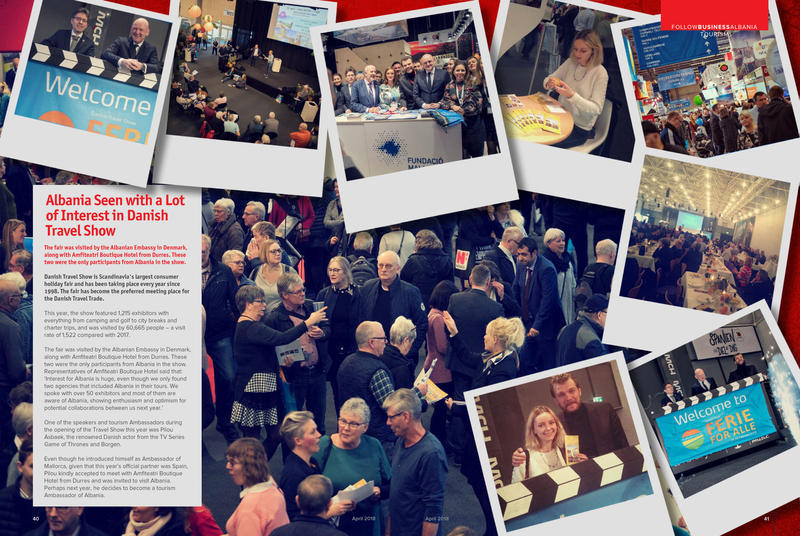 Danish travel show is Scadinavia's largest consumer holidays fair and has been taking place every year since 1998. The fair has become the prefered meering place for the Danish Travel Trade. 11.05.2018 - Tirana International Airport welcomes Danish airline Jet Time with tourists from Scandinavia! Jet Time is a Danish-owned airline founded in 2006 and merely operates as a Business-to Business company by delivering flight transportation solutions to charter and airlines. Since the start-up, Jet Time has grown to become the largest Danish-owned airline. 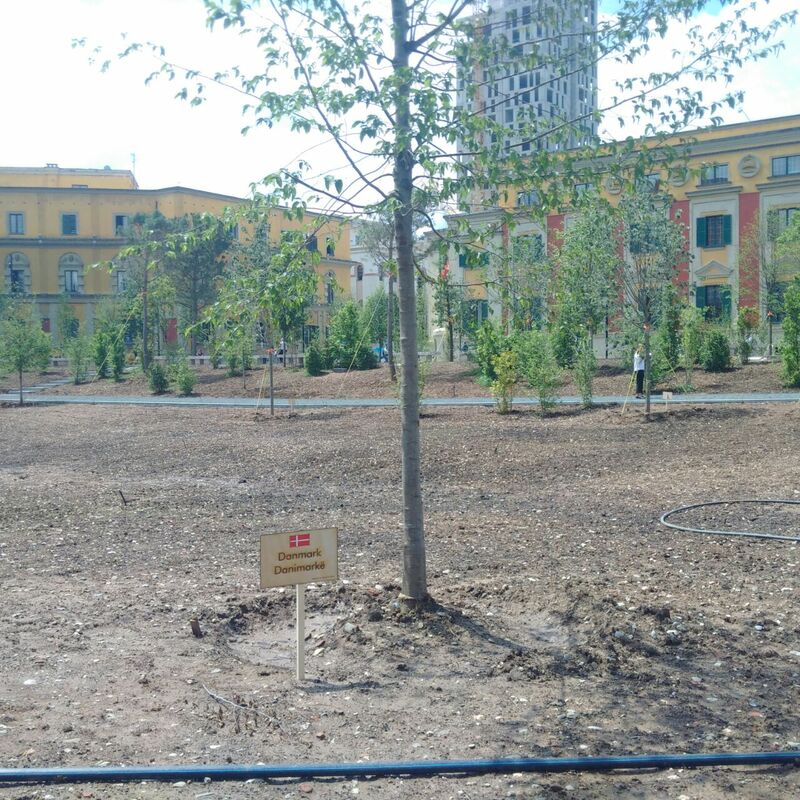 In cooperation with the Association of Local Autonomy of Albania and the Association of Albanian Municipalities, the Royal Danish Embassy Croatia – The Trade Council for Albania has the pleasure of inviting the representatives of the Albanian municipalities/cities and business community to a thematic business event called “Smart urban municipalities/cities and energy efficient industries”. The event will be held at the Rogner Hotel Tirana (Bulevardi Dëshmorët e Kombit) on Thursday, 7 June 2018. The goal of the event is to inspire and support smart and sustainable development of municipalities/cities. For that purpose, two of the most profiled mayors of Danish smart cities are coming to Albania to share best practice on their own examples from their own communities. The program consists of thematic panel discussions with Danish and Albanian representatives of municipalities/cities, leading Danish and Albanian companies offering smart solutions in the sectors of urban planning, mobility and well-being, as well as in the energy efficiency and environment field. The practical part will highlight best cases and exchange of experience from working with the municipalities/cities in Denmark and Albania. Entry to the event is free (limited number of seats, per invitation only) with obligatory registration in advance at https://www.urbandanish.solutions/albania2018/en/participation/.